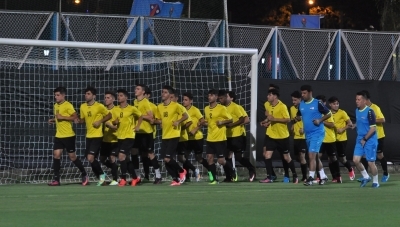 Kolkata, Oct 6 (IANS) Striker Mohammed Dawood is confident that Iraq will pose a strong challenge to Mexico despite practising for just a month or so when the two sides meet in their Group F clash of the FIFA U-17 World Cup which began on Friday. The sides meet on Sunday at the Salt Lake Stadium here. “The coaching staff did their best to get us ready for the World Cup. We trained in Iraq for 30-45 days,” Dawood told reporters here after their training session. “They are a very good team. We are prepared. We are also not easy opponents. We will try our best,” Dawood said of their opponents. Dawood will be the striker the Iraq U-17 national side will bank on. Their only previous appearance in a U-17 World Cup wasn’t particularly memorable and saw them finish bottom of their group in 2013, but they have come a long way since then. This was evident when they won the AFC U-16 Championships, beating Iran on penalties in the final. Dawood scored six goals in the tournament, including a hat-trick against Japan in the semi-finals. This earned him both the top scorer as well as player of the tournament awards. A fan of Younis Mahmoud, who helped Iraq win the 2007 Asian Cup beating Saudi Arabia 1-0 in the final, Dawood said he is an inspiration and the team would give their all to make the country proud. “Younis Mahmoud is a big inspiration. We will do our best in this competition and make our people happy,” he said.